HIQ-6383 has sophisticated design which including heater inside and applying special components in it. HIQ-6383 has a sophisticated design, which includes heater inside. The heater enables HIQ-6383 operates well under harsh circumstances, such as low temperature environments and high temperature environments. HIQ-6383 can sustain in -40°C~50°C (-40°F~122°F). 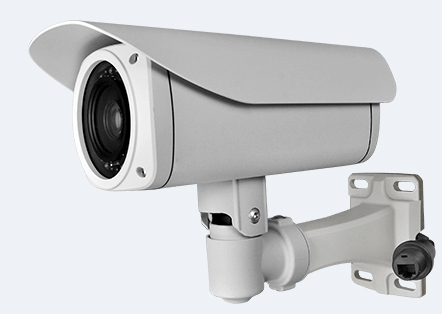 HIQ-6383 is an outdoor bullet camera, which is equipped with 1/2.7” Megapixel CMOS sensitization component and has all-IP architecture. The built-in web server open platform provides remote users with the real time video through Internet browser. The images captured by HIQ-6383 can be compressed into three formats: H.264/MPEG-4/M-JPEG, and have multiple resolutions: Full HD/HD/VGA/QVGA/QCIF. Under Full HD resolution, HIQ-6383 is capable of outputting excellent images: 30fps@1080p Real-time. Users can choose the suitable streaming format to meet different environmental concerns. The design for the device is beautiful as well as practical: the aluminum material and IP66-rated water-proof and dust-proof characteristics of HIQ-6383 make it safe and reliable to be applied to outdoor environments. The external vari-focal lens 3.6~16mm F1.2 of HIQ-6383 is an exclusive patent design, which provides users with easy camera installation and adjustment. The built-in 35 pcs IR LEDs, 20 meters light source, and mechanism IR cut filter make the images captured by HIQ-6383 clear under any light source, in day or night time. The network deployment of HIQ-6383 is simple and quick. It provides the installation tool, which automatically searches for IP cameras that already connect to the Internet. This “auto-search” feature alleviates the inconvenience of complex network settings for users. HIQ-6383 supports built-in 802.3at, 30.0 Watt of Power over Ethernet switch, thus users don’t need to additionally install the power lines. Consequently, the total power line cost is reduced sharply. HIQ-6383 provides surveillance functions including DI/DO, and Micro SD card local storage. The GUI design is based on the principle of user-friendly and easy manipulation. The NVR software is freely provided with HIQ-6383. It supplies users with omni-bearing video management and surveillance. HIQ-6383 is made with day/night dual-purpose, which is suitable for open environments and important entries surveillance.